The Model 67 is entry-level fixed-gantry, moving table 5 Axis CNC router that is used for trimming formed parts, patterns or molds using five-axis simultaneous motions. It is available with a variety of either single or dual moving solid aluminum table sizes. This video shows a variety of large sculptures created on a Thermwood 5 Axis Model 67 CNC Router. These were all done at John Cox's Creature Workshop in Queensland Australia. 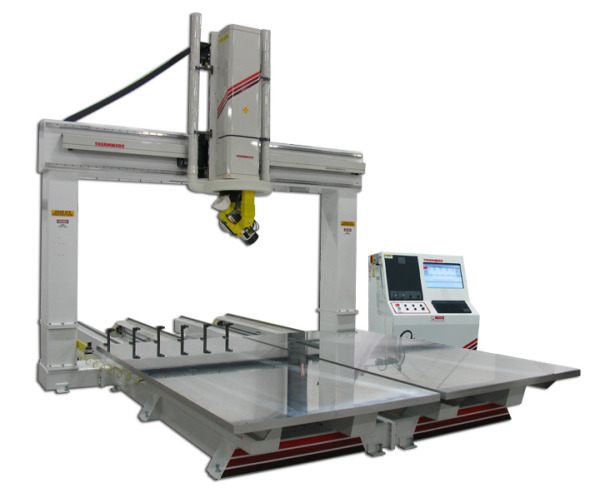 The Model 67 is a fixed-gantry, moving table 5 Axis CNC Router that features single table sizes from 5'x5' to 10'x5' or dual table sizes from 5'x5' to 5'x12'. It has a 7.5HP HSD Dual End Spindle (3,000-18,000RPM) and Z axis height up to 60".